Firstly, you'll concentrate on the RESTful back-end API built with Nest.js. You'll then focus on the frontend, which you will build with Vue.js. MongoDB installed on your machine. Follow the instructions here to download and install it for your choice of operating system. To successfully install MongoDB, you can either install it by using Homebrew on Mac or by downloading it from the MongoDB website. A text editor installed, such as Visual Studio Code, Atom, or Sublime Text. You’ll make use of the nest command to manage your project and use it to generate relevant files — like the controller, modules, and providers. Immediately after running the command, nest will prompt you to provide some basic information like the <span class="highlight">description</span>, <span class="highlight">version</span>, and <span class="highlight">author</span>. Go ahead and provide the appropriate details. Hit ENTER on your computer to proceed after responding to each prompt. Next, you’ll choose a package manager. For the purpose of this tutorial, select npm and hit ENTER to start installing Nest.js. This will generate a new Nest.js project in a <span class="highlight">blog-backend</span> folder within your local development folder. You’ve installed @nestjs/mongoose, which is a Nest.js dedicated package for an object modelling tool for MongoDB, and mongoose, which is a package for Mongoose. You’ve successfully generated the project by leveraging the availability of the Nest CLI command. Afterward, you proceeded to run the application and accessed it on the default port 3000 on your local machine. In the next section, you’ll take the application further by setting up the configuration for the database connection. In this step, you’ll configure and integrate MongoDB into your Nest.js application. You’ll use MongoDB to store data for your application. MongoDB stores its data in documents as field : value pairs. To access this data structure, you’ll use Mongoose, which is an object document modeling (ODM) that allows you to define schemas representing the types of data that a MongoDB database stores. Here, you have used Mongoose to define the type of data that you will store in the database. You’ve specified that all the fields will store and only accept string values. Save and close the file when you are finished editing. You’ve marked each of the individual properties in the CreatePostDTO class to have a data type of string and as readonly to avoid unnecessary mutation. Save and exit the file when you are finished editing. In this step, you have created a database schema for the database, an interface, and a data transfer object for the data your database will store. Next, you’ll generate a module, controller, and service for your blog. 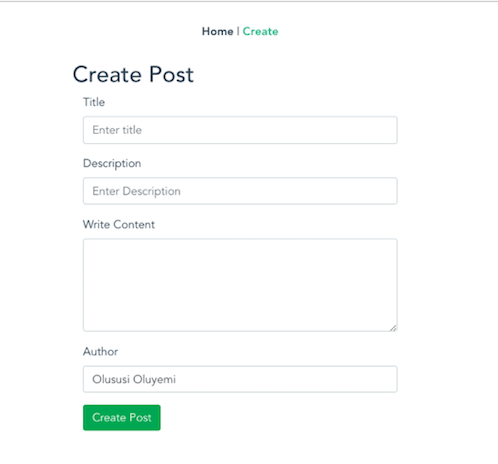 In this step, you’re going to improve on the existing structure of the application by creating a module for your blog. This module will organize the file structure of your application. Next, you’ll create a controller to handle routes and process HTTP requests from the client. To wrap things up, you’ll set up a service to handle all the business logic that is too complex for the controller of the application to process. A module in Nest.js is identified by the @Module() decorator and takes in an object with properties such as controllers and providers. Each of these properties takes an array of controllers and providersrespectively. In the constructor, you added @InjectModel(``'``Post``'``), which will inject the Post model into this BlogService class. You will now be able to use this injected model to retrieve all posts, fetch a single post, and carry out other database-related activities. 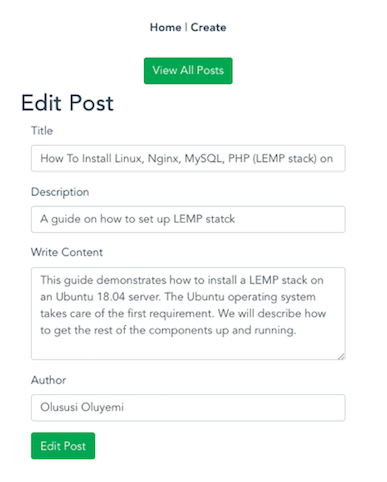 getPosts(): This method will carry out the functionality of receiving an HTTP GET request from the client to fetch all posts from the database and then return the appropriate response. It is decorated with a @Get(``'``posts``'``). For example, the BlogController that you have created in this section has a prefix of blog and a method named getPosts() that takes in a prefix of posts. This means that any GET request sent to an endpoint of blog/posts(http:localhost:3000/blog/posts) will be handled by the getPosts()method. This example is similar to how other methods will handle HTTP requests. In this section, you have created a module to keep the application more organized. You also created a service to handle the business logic for the application by interacting with the database and returning the appropriate response. Finally, you generated a controller and created the required methods to handle HTTP requests such as GET, POST, PUT, and DELETE from the client side. In the next step, you’ll complete your back-end setup. This module uses the MongooseModule.forFeature() method to define which models should be registered in the module. Without this, injecting the PostModel within the BlogService using @injectModel() decorator wouldn’t work. Save and close the file when you have finished adding the content. In this step, you’ve created the complete backend RESTful API with Nest.js and integrated it with MongoDB. In the next section, you’ll configure the server to allow HTTP requests from another server, because your frontend application will be running on a different port. 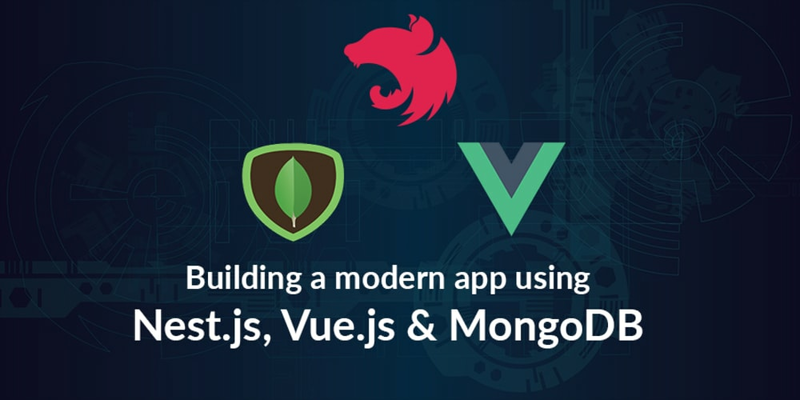 Now that you have completed the back-end setup, you’ll shift your focus to the frontend and use Vue.js to consume the APIs built so far. You’ll see a short prompt after you’ve entered this command. Choose the manually select features option, and then select the features you’ll need for this project by pressing SPACE on your computer to highlight multiple features. You’ll select Babel, Router, and Linter / Formatter. For the next instructions, type y to use history mode for a router; this will ensure that history mode is enabled within the router file, which will automatically generate for this project. In addition, select ESLint with error prevention only to pick a linter/formatter configuration. Next, select Lint on save for additional Lint features. Then select to save your configuration in a dedicated config file for future projects. Type a name for your preset, like <span class="highlight">vueconfig</span>. Vue.js will then start creating the application and all its required dependencies in a directory named <span class="highlight">blog-frontend</span>. Your front-end application will be making an API call to the back-end API on a particular domain from different components within the application. In order to ensure proper structure for this application, you can create a helperfile and define the server baseURL. By defining a baseURL, you’ll be able to call it from anywhere within you Vue.js component files. In the event that you need to change the URL, it will be an easier process to update the baseURL in this file rather than across your application. In this section, you installed the Vue CLI, a tool for creating a new Vue.js application. You used this tool to craft the <span class="highlight">blog-frontend</span> application. In addition, you ran the application and installed a library named Axios, which you will use whenever there is an HTTP call within the app. Next, you will create components for the application. Now you’re going to create reusable components for your application, which is the standard structure for Vue.js applications. The component system in Vue.js makes it possible for developers to build a single, independent unit of an interface that can have its own state, markup, and style. This makes it appropriate for components in Vue.js to be reusable. This is the <template> section of the CreatePost component. It contains the HTML input elements required to create a new post. Each of the input fields has a v-model directive as an input attribute. This is to ensure two-way data bindings on each of the form input to make it easy for Vue.js to obtain the user’s input. Here you’ve added a method named createPost() to create a new post and submit it to the server using Axios. Once a user creates a new post, the application will redirect back to the homepage where users can view the list of created posts. You imported Router from the vue-router module and instantiated it by passing the mode and routesparameters. The default mode for <span class="highlight">vue-router</span> is a hash mode, which uses the URL hash to simulate a full URL so that the page won’t be reloaded when the URL changes. In order to make the hash unnecessary, you have used history mode here to achieve URL navigation without a page reload. Finally, within the routes option, you specified the path for the endpoint — a name for the route and the component that should be rendered when the route is called within the application. Save and exit the file. Save and exit the file, and then restart the application with npm run serve for your <span class="highlight">blog-frontend</span>, if it is not currently running. Note: Ensure that both the back-end server and the MongoDB instance are running as well. 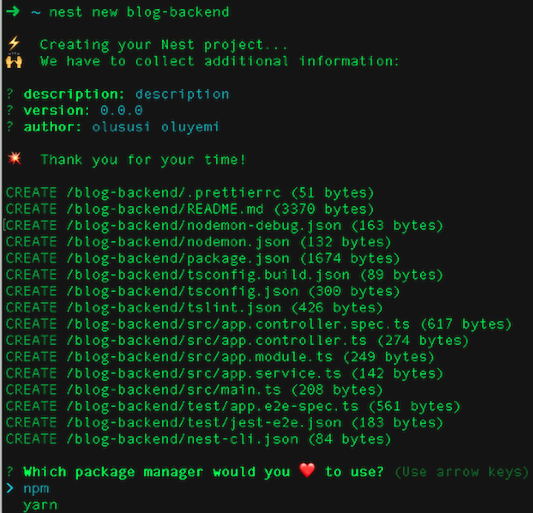 If otherwise, navigate to the <span class="highlight">blog-backend</span> from another terminal and run npm run start. Also, start the MongoDB service by running sudo mongod from a new terminal as well.